As one of best looking pair of safety goggles in the world you could be fooled into thinking this model may lack practical value. The Pilot however not only offers both anti-scratch and anti-fog lenses, but also has category 9 protection against molten metals and other hot solids. 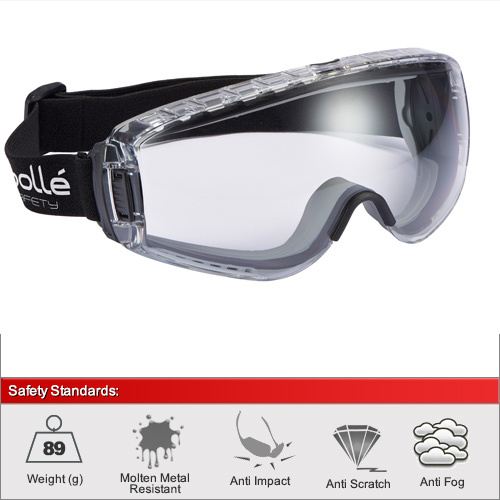 Since the lens is specifically designed using indirect ventilation from both the top & bottom, they have excellent anti-fog performance as well as certified protection to liquid droplets and dust particles under EN166 category 3 & 4. 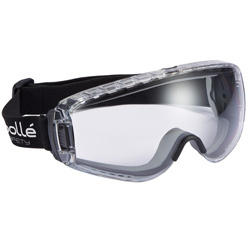 The adjustable strap is attached to the body of the goggle using a special quick release system making it especially versatile when used with helmets. They have also been designed to fit over the top of most standard prescription glasses. Available in both a clear and CSP lens. The clear lens for excellent optical quality 1 performance and protection against molten metals and other hot solids. The CSP lens for working in low and bright lights conditions in extreme temperatures.